Let’s revisit five of the most believable UFO sightings of the 21st century. In 2017, several news organizations revealed the existence of the Advanced Aviation Threat Identification Program (AATIP), a U.S. government-funded investigation into unidentified flying objects from 2007 to 2012. This secret $22 million program, however, was not the first of its kind. Official government UFO studies began in the late 1940s with Project Sign, providing some of the most credible videos of aerial phenomena to date. The 2017 revelation that the U.S. government was actively researching UFOs re-ignited world interest in UFOs and aliens. Below are five of the most believable UFO sightings of the 21st century. It takes a lot for motorists to stop alongside a highway to look toward the sky, but on July 14, 2001, drivers on the New Jersey Turnpike did just that. For around 15 minutes just after midnight, they marveled at the sight of strange orange-and-yellow lights in a V formation over the Arthur Kill Waterway between Staten Island, New York, and Carteret, New Jersey. Carteret Police Department’s Lt. Daniel Tarrant was one of the witnesses, as well as other metro-area residents from the Throgs Neck Bridge on Long Island and Fort Lee, New Jersey near the George Washington Bridge. 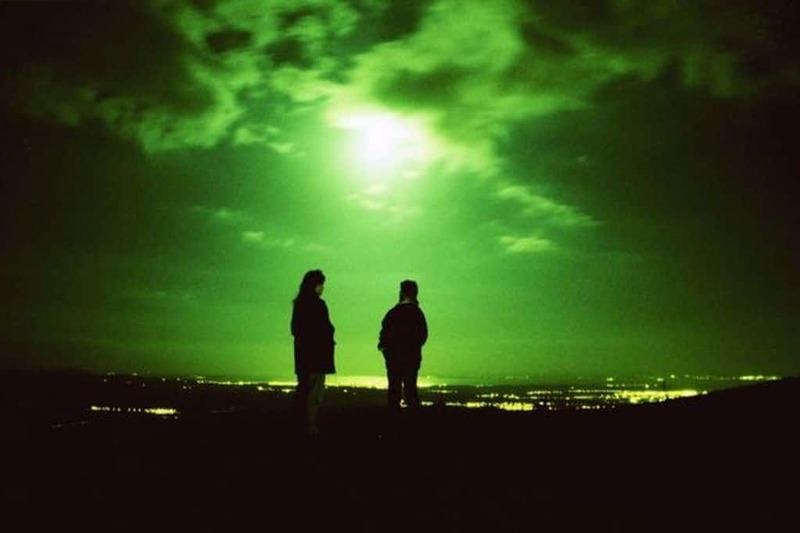 Air-traffic controllers initially denied that any airplanes, military jets or space flights could have caused the mysterious lights, but a group known as the New York Strange Phenomena Investigators (NY-SPI) claimed to receive FAA radar data that corroborated the UFO sightings from that night. On November 14, 2004, the aircraft carrier USS Princeton noted an unknown craft on radar 100 miles off the coast of San Diego. For two weeks, the crew had been tracking objects that appeared at 80,000 feet and then plummeted to hover right above the Pacific Ocean. When two FA-18F fighter jets from the aircraft carrier USS Nimitz arrived in the area, they first saw what appeared to be churning boiling water in an oval shape underneath the surface. Then, in a few moments, a white Tic Tac-shaped object appeared above the water. It had no visible markings to indicate an engine, wings or windows, and infrared monitors didn’t reveal any exhaust. Commander David Fravor and Lt. Commander Jim Slaight of Strike Fighter Squadron 41 attempted to intercept the craft, but it accelerated away, re-appearing on radar 60 miles away. It moved three times the speed of sound and twice the speed of the fighter jets. Flight 446 was getting ready to fly to North Carolina from Chicago’s O’Hare International Airport, when a United Airlines employee on the tarmac noticed a dark grey metallic craft hovering over gate C17. That day, November 7, 2006, a total of 12 United employees—and a few witnesses outside the airport—spotted the saucer-shaped craft around 4:15 p.m. The witnesses say it hovered for about five minutes before shooting upward, where it broke a hole in the clouds—enough that pilots and mechanics could see the blue sky. The news report became the most-read story on The Chicago Tribune’s website to that date and made international news. However, because the UFO was not seen on radar, the FAA called it a “weather phenomenon” and declined to investigate. The small town of Stephenville, Texas, 100 miles southwest of Dallas, is mostly known for its dairy farms, but in the evening of January 8, 2008, dozens of its residents viewed something unique in the sky. Citizens reported seeing white lights above Highway 67, first in a single horizontal arc and then in vertical parallel lines. Local pilot Steve Allen estimated that the strobe lights “spanned about a mile long and a half mile wide,” traveling about 3,000 miles per hour. No sound was reported. Witnesses believed the event was reminiscent of the Phoenix Lights sightings of 1997. While the U.S. Air Force revealed weeks later that F-16s were flying in the Brownwood Military Operating Areas (just southwest of Stephenville), many townspeople didn’t buy that explanation, believing that what they saw was too technologically advanced for current human abilities. Leaked in 2017 along with the news of the Advanced Aviation Threat Identification Program, was a video that revealed an encounter between an F/A-18 Super Hornet and an unidentified flying vehicle. Seen along the East Coast on a Raytheon Advanced Targeting Forward-Looking Infrared (ATFLIR) Pod, the craft was similar to that spotted off San Diego in 2004: a fast-moving white oval about 45-feet-long without wings or exhaust plume. The pilots tracked the object at 25,000 feet above the Atlantic Ocean as it flew away and simultaneously rotated on its axis. No explanation ever emerged.